As a convenient guide to sizing photographs for PowerPoint, assume that the set up for an on screen show gives a page size of 10"x7.5" at 100dpi. Photographs scanned at this size will fill the screen. It is very rarely necessary to scan pictures at a higher resolution. We often see PowerPoint files which contain only a few pictures, but are over 50Mb in size. To keep files sizes reasonable, don't save pictures as bitmaps (bmp) or Tiff, always save as jpeg, using medium compression/image quality. Scan your photographs at an appropriate size, as described above. If the pictures are black and white, make sure they are saved as greyscale to keep file sizes small. If you are scanning pictures from books or magazines, use the "descreen" option to remove the dot patterns from the published picture. Inserting a sheet of black paper between pages helps prevent text showing through from other pages. If you have photos supplied to you from other sources, check the image/file size is not too large, and reduce the size if necessary. 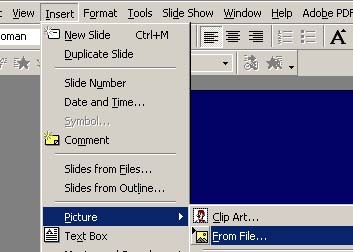 Open your PowerPoint slide, click on "insert" then "Picture", and "From File" From the window that appears, browse to the folder where you have saved your picture, select it and click on "insert". The picture will now appear in your slide. If you only have one photo in a slide, use all the available space. To view example, click here. You may be able to reduce the file size of existing presentations.